"These, Sir, are the facts that explain how this miscarriage of justice came about. The evidence of Dreyfus's character, his affluence, the lack of motive and his continued affirmation of innocence combine to show that he is the victim of the lurid imagination of Major du Paty de Clam, the religious circles surrounding him, and the 'dirty Jew' obsession that is the scourge of our time." "We have before us the ignoble spectacle of men who are sunken in debts and crimes being hailed as innocent, whereas the honour of a man whose life is spotless is being vilely attacked: A society that sinks to that level has fallen into decay." "We are horrified by the terrible light the Dreyfus affair has cast upon it all, this human sacrifice of an unfortunate man, a 'dirty Jew'. Ah, what a cesspool of folly and foolishness, what preposterous fantasies, what corrupt police tactics, what inquisitorial, tyrannical practices! What petty whims of a few higher-ups trampling the nation under their boots, ramming back down their throats the people's cries for truth and justice, with the travesty of state security as a pretext!" "As for the people I am accusing, I do not know them, I have never seen them, and I bear them neither ill will nor hatred. To me they are mere entities, agents of harm to society. The action I am taking is no more than a radical measure to hasten the explosion of truth and justice." "I have but one passion: to enlighten those who have been kept in the dark, in the name of humanity which has suffered so much and is entitled to happiness. My fiery protest is simply the cry of my very soul. Let them dare, then, to bring me before a court of law and let the enquiry take place in broad daylight! I am waiting." 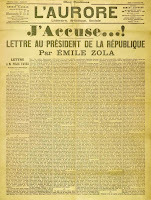 Emile Zola was an amazing man of truth, he was not Jewish but stood up against all the anti-Semites, who were so happy to see a Jew imprisoned even though he was innocent. Thank you Emile for your bravery and with your help, the state of Israel was born. How i wish you were around today. May you rest in peace.Shalom.